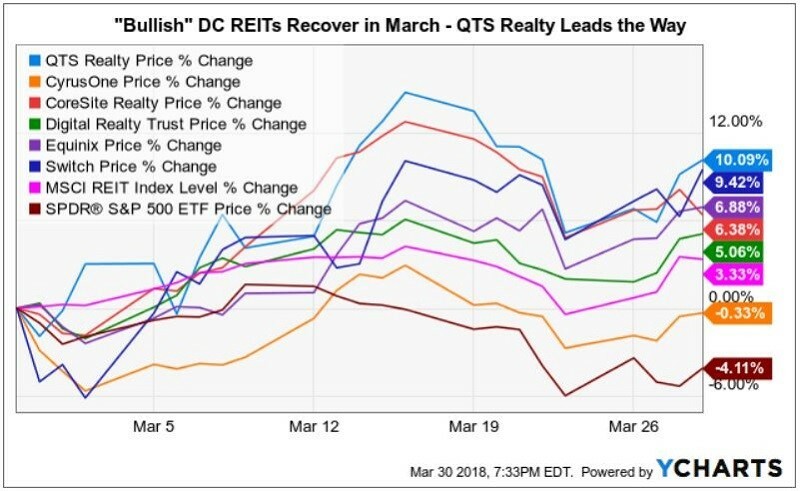 Clearly, the first quarter was rough for QTS Realty Trust shareholders, following the company’s unanticipated shift in strategy and reorganization, announced in late February. However, the QTS share price drop was exacerbated by a perfect storm of risk factors negatively impacting global equity markets, including: Republican Tax Bill-fueled deficits, a more hawkish Fed, steel and aluminum tariffs, trade war concerns, and a chaotic White House. This has resulted in investors and analysts being forced to reset expectations in a highly volatile environment. Property REITs in general, including data center operators, had a poor start to 2018. On the other hand, March was far better than February, as investors started to focus on upcoming first-quarter results. QTS’s outsize drop was primarily a result of its 2018 guidance, which included the surprise reorganization and pivot away from signature "C3" Cloud and Managed services. Since the company’s IPO in 2013, those in-house C3 service offerings differentiated QTS from its publicly traded peers. The company plans to focus resources on Hyperscale (C1) and Hybrid IT colocation customers (C2) going forward. Notably, QTS will be keeping its 15 most popular (and profitable) managed services, including in-house security and compliance offerings. That signal was essentially ignored by investors, given the near-term impact from the shift away from C3 offerings resulting in a reduction of $65-$75 million of "non-core" C3 revenues going forward. This will leave a large revenue hole for QTS to backfill, resulting in analysts slashing their earnings estimates for 2018. However, there was also immediate good news for shareholders to evaluate. The expense synergies from winding down private cloud offerings and 85 percent of QTS managed service products will result in a 600-basis point increase in EBITDA margins for 2018 and beyond. Bottom line: cloud and managed services was a slow-growth and low-margin business segment. Wall Street analysts hate surprises. Clearly, they did not see this shift in focus coming, and, predictably, most reactions have been negative. Raymond James immediately downgraded QTS from Outperform to a Sell rating. Several other analysts followed suit with multiple downgrades and lower price targets. In mid-March there was a notable upgrade by Goldman Sachs to Buy, with a $45 price objective. However, the next day Credit Suisse came out with a Sell and $31 price target. The unusual lack of consensus among industry analysts has resulted in a bull-vs-bear tug of war. There is an unwritten law of the universe: the larger the deal, the less certain is its timing. On March 2, not long after reporting Q4 2017 earnings, QTS announced a 24MW build-to-suit win in Northern Virginia with a "global cloud-based software company." Most notably, this hyper-scale lease was signed with an existing QTS customer. QTS followed this on March 16 with announcements of a couple multi-megawatt renewals in the Atlanta metro, totaling 19MW, signed at pricing levels "above pre-renewal rates." These deals highlight that there is more that goes into a decision to lease from a data center operator than just dollars and cents. When it comes to super-wholesale wins, a proven track record and strong relationships can often be the deciding factor. It appears these hyper-scale wins helped QTS shares rebound and gain 14.9 percent from the February low of $31.58 to close at $36.29 per share on March 29, the last trading day of Q1 2018. Arguably, this illustrates another instance where Mr. Market's "pendulum of pessimism" may have swung too fast, too far. In an interview with Data Center Knowledge, Tag Greason, whom QTS recently named Chief Hyperscale Officer (his previous title was executive VP of Hyperscale Sales), shared a bit more color regarding inking these long-term contracts. QTS has been a dominant player in the Atlanta market. However, the low cost of land and energy, and potential tax incentives are attracting a lot of competition, including CyrusOne and Switch, who recently joined other incumbents T5, Digital Realty, and Ascent in the market. Greason pointed out these Atlanta wins were quite timely. These two hyper-scale lease renewals in the Atlanta market were long-time QTS customers. QTS locked down the aggregate of 19MW in renewals for about five years, according to the announcement, which also mentioned that the QTS portfolio weighted-average lease term, or WALT, had increased to 48 months. 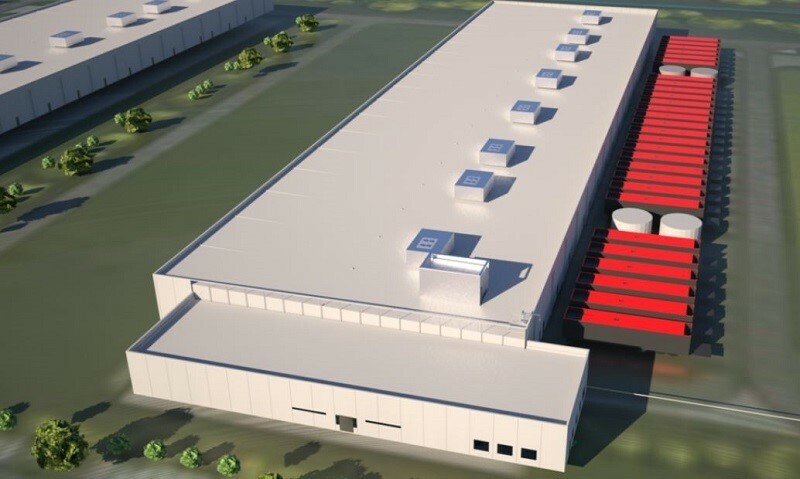 Meanwhile, QTS is now in the mix when it comes to hyper-scale build-to-suits in Northern Virginia's Data Center Alley, the largest and most competitive US data center market. Greason explained that an existing customer's requirement unexpectedly changed and QTS had to quickly secure an option to purchase the land parcel in Manassas, Virginia, to win the deal for this 24MW build-to-suit. The lower cost of land in Manassas versus Ashburn paved the way for QTS's new one-story "Optimus” design for that campus. This will become a standard design in markets where the price of land makes one-story builds feasible. Initially, QTS's Manassas customer will occupy a 5MW data hall, but they will be paying rent on the entire 24MW powered shell, making this deal immediately accretive for QTS shareholders. In a matter of weeks, QTS has demonstrated the ability to step up its game with hyper-scale lease signings in two of the hottest US data center markets. When publicly traded companies disappoint investors, the natives can quickly become restless. A recent Kansas City Business Journal (subscription) article details the spat between REIT activist Jonathan Litt's Land & Buildings fund and the QTS board. 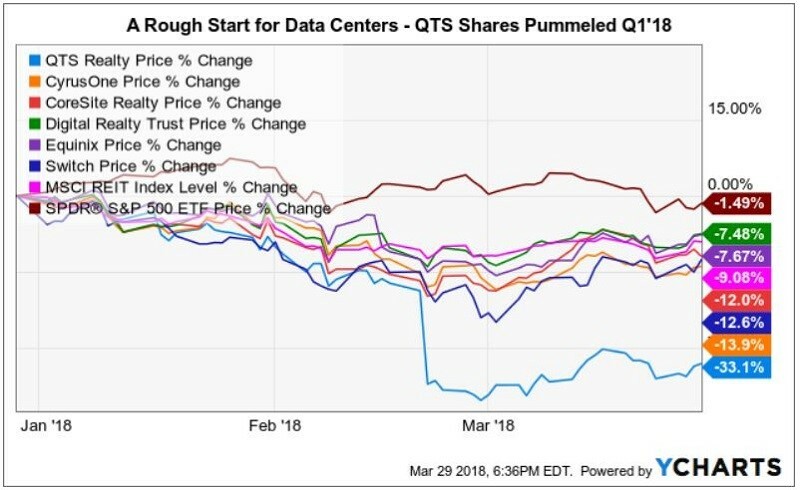 QTS’s total shareholder returns have underperformed Data Center Peers by ~97% since the Company’s IPO, and by ~35% in the past year. FFO per share growth has underperformed Data Center Peers by 43% since the Company’s IPO and is expected to trail peers by 14% again this year. The $326 million Carpathia acquisition in 2015, which was touted as a cross-selling opportunity across the platform, has had deteriorating financial performance and no clear benefit to the rest of the business. QTS maintains a dual-class share structure with Mr. Williams [Chad Williams, chairman and CEO] the sole owner of Class B common stock, affording him special tax protections and 11% voting power despite only owning 0.1% of QTS Class A common stock. In March 2018, QTS awarded Mr. Williams 200,000 options above and beyond the typical compensation at trough price levels for “additional motivation”– two weeks after the share price declined 23% in one day. The Board is confident that QTS has the right team and right strategy in place, and that the execution of our strategy and continued efficient capital allocation will deliver disciplined growth and sustainable value. QTS is open to and appreciates input from shareholders, and is committed to taking actions to enhance shareholder value. The QTS Board and management team remain focused on executing our strategy to deliver substantial near- and long-term value creation. One notable item the Land & Buildings letter did not mention was the colossal sale of 85% of QTS common shares owned by Williams last summer. On August 14, Williams sold 682,576 of his 804,132 QTS shares for an average of $54.25 per share, or ~$37 million total. On the same day, Williams exercised an option to purchase 115,790 shares at $34.24, or $3.96 million. This brought the count of QTS common shares held by Williams back up to 315,696. In addition to common shares, Williams owns a large number of operating partnership (OP) units that give him 11 percent ownership and voting rights. Clearly, Williams already had plenty of incentive to attempt to right the good ship QTS and regain the confidence of Wall Street analysts without being granted another 200,000 shares of incentive options in March. In retrospect, this QTS board decision could easily be viewed through the lens of "poor optics," given how events unfolded. Meanwhile, QTS inked some significant wins just a few weeks after surprising the Street. What if these hyper-scale deals were signed a few weeks earlier and were reported along with Q4 2017 results? Would investor perceptions of QTS's reorganization be more positive? Unfortunately, we will never know the answer. So, there is plenty of ammunition to support both the bulls and the bears. Going forward, here is the question that matters: Will the QTS strategic realignment toward Hyperscale and Hybrid IT colocation and pivot away from Cloud and Managed services deliver earnings growth for investors? Stay tuned.